A dye can generally be described as a colored substance that has an affinity to the substrate to which it is being applied. 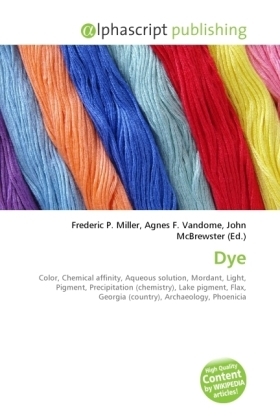 The dye is generally applied in an aqueous solution, and may require a mordant to improve the fastness of the dye on the fiber. Both dyes and pigments appear to be colored because they absorb some wavelengths of light preferentially. In contrast with a dye, a pigment generally is insoluble, and has no affinity for the substrate. Some dyes can be precipitated with an inert salt to produce a lake pigment, and based on the salt used they could be aluminum lake, calcium lake or barium lake pigments. Dyed flax fibers have been found in the Republic of Georgia dated back in a prehistoric cave to 36,000 BP. Archaeological evidence shows that, particularly in India and Phoenicia, dyeing has been extensively carried out for over 5000 years. The dyes were obtained from animal, vegetable or mineral origin, with no or very little processing. By far the greatest source of dyes has been from the plant kingdom, notably roots, berries, bark, leaves and wood, but only a few have ever been used on a commercial scale.